I showed you part of my porch redo earlier this week CLICK HERE, and today I thought I would share the other side of the porch. This post is sponsored by CALICO. 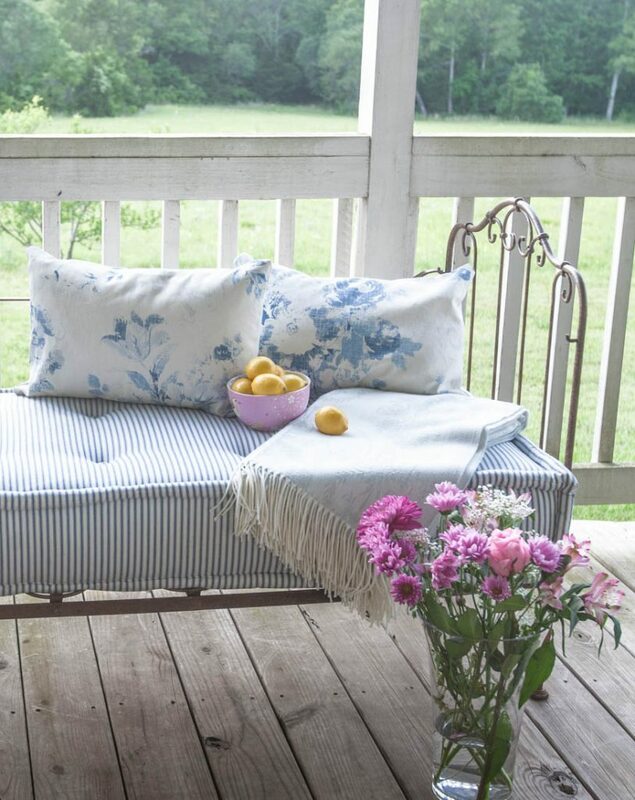 I thought you might enjoy some time hanging out here on my back porch at the farm, and see these gorgeous blue porch pillows. The bed is an antique French crib. I folded down the front side and had a cushion custom made for the crib. Now it serves as a settee for us. It’s not big enough for sleeping, but definitively it works when you want a place to sit. I took this photos right before dusk and it’s so quiet this time of day. The frogs are pretty loud in the pond, and the breeze picked up just as we sat down. 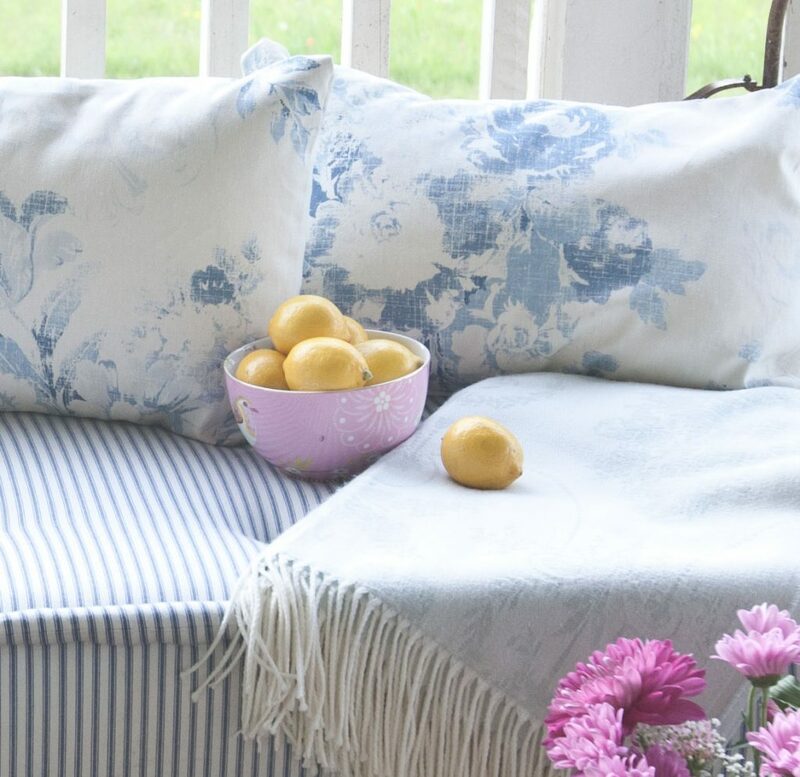 These blue porch pillows just pop with this gorgeous fabric. It’s very cheery in person, and I think you’ll really like it. It’s Brianna Floral Twill – Ralph Lauren – Stoneware Blue. It’s a twill fabric, so it’s very sturdy, 55% linen and 45% cotton. It’s a floral pattern that has been purposed faded in places. It can be used for Drapery, Bedding, Pillows, and Light Use Furniture. I love soaking up the breeze, the smell of the cut grass and the sounds of nature here. The pillow is a simple envelop enclosure, that you can make very quickly. There are several no-sew options if you don’t like to sew. If you look at the view below, that’s exactly where I saw some young deer playing, until Molly the collie scared them off. These are considered indoor fabrics, so I do bring them in at night. I wouldn’t let them get wet, and I would avoid prolonged direct sunlight. I almost forget to announce my book winner from my Calico giveaway. It’s Debra D! Congratulations, and I’ll be sending your book as soon as it gets here from the publisher. Spring is such a great time to get your porch ready for use. If the weather isn’t warm yet where you are, it will be soon. CALICO also has many outdoor fabrics that you can leave outdoors that resist fading, and those would be great choices for your porch. That is beautiful fabric to go along with that beautiful view! Anita-I love your new pillows but I especially love your custom made cushion! I live in the Houston area and was wondering if you would share the name of your upholstery place. Just bought your new book. Love that too! Thanks! Patricia, try Neomi’s on Stuebner Airline north of FM1960. I’ve used them a lot. I have a deep dark secret blogger/photographer question. 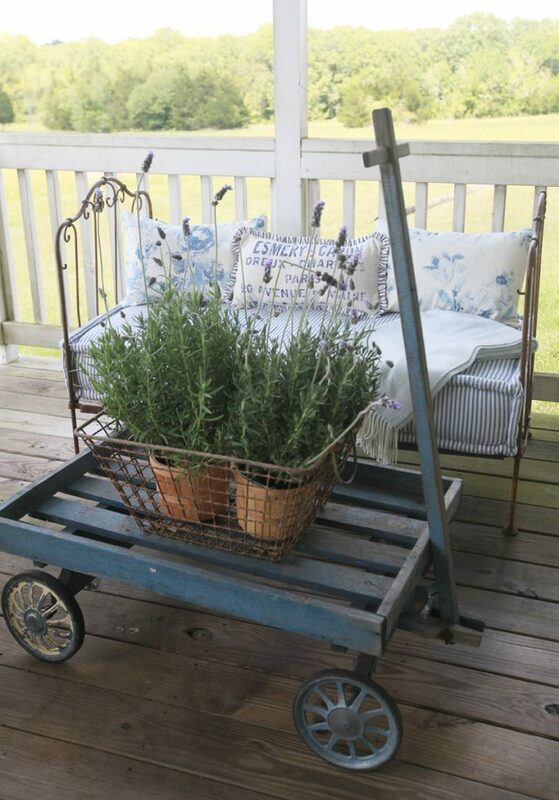 Do you move the daybed against the railing to style for the view for photos, or are you able to enjoy it as is? I just adore these French mattress cushions! But I have two small kids who leave greasy handprints and apple juice stains EVERYWHERE. It was expensive so I baby it. For a lot of use, I would wait or use a ton of scotch guard! Perfect! Love the Texas country side and your pretty Round Top home. In my country we don’t have porches. But I would love to have one! Anita this is simply gorgeous! I would love to feature you at next week’s Thursday Favorite Things! Simply leave a comment with the number of your link up if you would like to be featured. Thanks for the beautiful inspiration!